takes 20 seconds to complete. Winning an RCNi Nurse Award can be a tremendous boost. When your name is called out at the ceremony, it is a cause for celebration, an exciting end to a great evening and recognition for all the hours and hard work you have committed – often in your own time – to improving the care of your patients. This recognition can have a lasting impact on the winner’s nursing practice. Often humble about their achievements, it can give them the confidence to take their projects further and their skills into new areas. 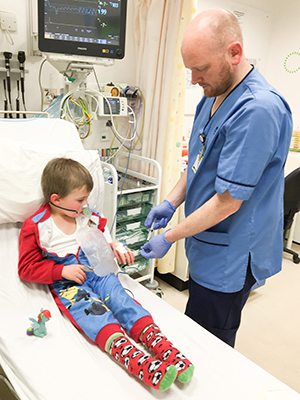 This has been the experience of paediatric emergency nurse Drew McDonald, who won the Child Health category in the RCNi Nurse Awards 2017. The senior staff nurse developed a sepsis recognition tool for triage, successfully implementing it at Royal Aberdeen Children’s Hospital in Scotland. With Mr McDonald’s passion for improving sepsis care, one of the benefits of winning has been the platform it has given him to raise awareness of his project and its importance nationally. He has linked with colleagues in other trusts, and honed his presentation skills by regularly presenting his project, including hosting a popular session at RCNi’s recent Nursing Children and Young People conference. NHS Grampian chief nurse Caroline Clark, who is Mr McDonald’s manager and nominated him for the award, has also seen the benefits of his success. She put him forward after being impressed by his dedication, commitment and enthusiasm. ‘He often came in on his days off to present at meetings, and much of the work was carried out in his own time,’ she says. ‘Drew has become a more confident practitioner and his achievements have had a positive impact on the nursing team. Since winning the award, Mr McDonald has started working with improvement groups for other clinical areas, such as deterioration, and local award groups.